I spotted this pic the other day of Mel B in this belted and rouched mini dress while attending the Baked Lays party for the “Only in a Woman’s World” series premiere at CoCo Deville. She looks fantastic but on closer inspection I felt the dress had one too many details. 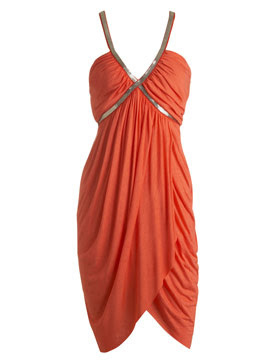 The one-shoulder look, the belted waist, and the draping. I'm not really a fan of adding a belt to a draped style (I think it negates the concept) so I decided to find a couple of alternatives. Check them out. 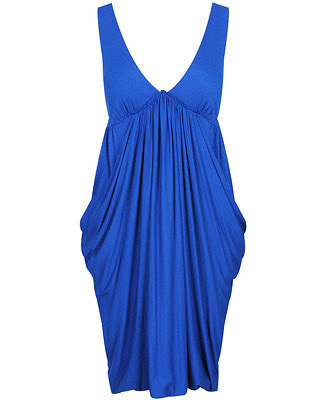 This dress has a nice Grecian look. It will however highlight the hip area, so be aware if your hips are a problem area for you. This dress has a more fitted look similar to Mel B's dress. The sweetheart necklace is very feminine. wow, i love the peach dress.